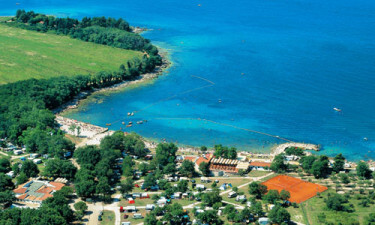 Overlooking crystal clear waters on the coastline of the Adriatic sea, Aminess Park Mareda is an ideal luxury camping site for travellers looking to unwind in a natural setting. With luxury mobile home accommodation surrounded by oak forests and green fields, it offers tranquility just moments from the beach. 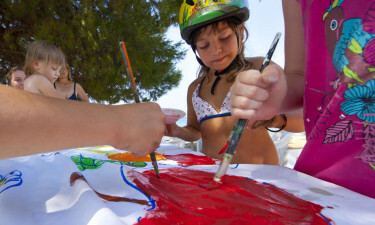 There are many activities to enjoy on site and in the surrounding region, such as water sports, hikes and cultural visits to towns like Novigrad on the Istrian coast. Aminess Park Mareda's major draw is its stunning setting with panoramic views of the coastal waters. For nature lovers looking for peaceful walks, cycling trips or relaxing sea front terraces to sit and unwind on with a glass of wine, Aminess Park Mareda is the perfect camping holiday. For a true seaside retreat, book your next camping holiday with Aminess Park Mareda through LuxCamp. Why choose Aminess Park Mareda? Built upon raised terraces with steps leading directly into the sea, Aminess Park Mareda offers you the opportunity for true seaside camping. Widely renowned as some of the cleanest and clearest waters in the world, you can lounge on a purpose-built promenade or take a dip in the crystal clear sea. For those wanting to make a splash in natural salt water from the comfort of a pool, Aminess Park Mareda have built a seaside swimming pool which sits partially raised for full seaside views. This is ideal for children to swim in safety or for couples to relax and enjoy a romantic sunset in the evening.